A progressive anti-aging collection to restore youth and infuse vitality. Utilizing innovative peptides such as Idealift and CS Peptide, along with Glycolic acid to encourage collagen and elastin production, reduce fine lines and wrinkles and improve overall tone and texture. PEPTIDE GLYCO CLEANSER: (2 FL OZ / 59.1 mL) to transform skin texture for a silky smooth, healthy glow. ESSENTIAL B5 HYDRATING SERUM: (0.5 FL OZ / 14.8 mL) to address dehydration and replenish moisture levels. NOURISHING PEPTIDE RICH: (1 FL OZ / 29.6 mL) to lavishly strengthen and hydrate with advanced peptides. SUNARMOR SPF50: (1 OZ / 28.3 g) to shield your skin and fight future signs of aging. 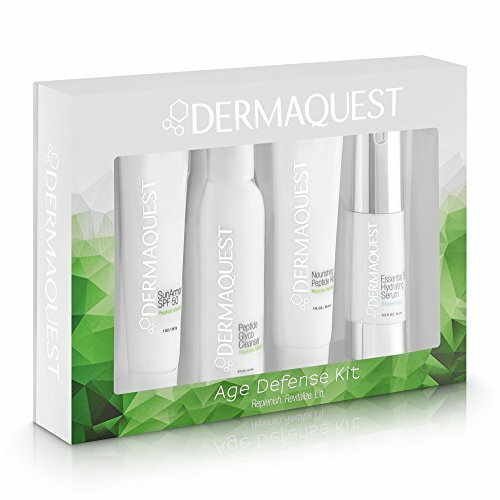 If you have any questions about this product by DermaQuest, contact us by completing and submitting the form below. If you are looking for a specif part number, please include it with your message.